Okay, you’re either thinking, “Mountain Dew Jelly, that’s sounds really great! !”, or you might be thinking, “Mountain Dew Jelly, that’s sounds awful!” People either love or hate this stuff. The fact is, that’s it’s a really fun inexpensive gift to give away during the holidays or any time. If you’re wondering what it tastes like, it actually doesn’t taste like Mountain Dew after it loses its fizz. It ends up with a slightly lemon flavor. Combine the Mountain Dew soda and lemon juice in a large stock pot. Sprinkle the pectin on top of the juice mixture and use a whisk to mix it together. Stirring constantly, heat until boiling. Boil for one minute. Ladle the jelly into hot sterilized jars, leaving ¼ inch head space, and process in boiling water canner for 10 minutes. If you like this recipe, you can use other types of soda (Dr. Pepper, orange soda, etc.) in place of the Mountain Dew. 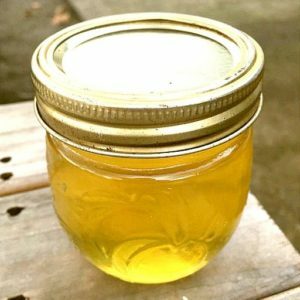 I also have a great recipe for rootbeer jelly you might like to try.